Here are photos of the sun’s path in the sky on the winter (top) and summer (below) solstices. The pictures also show how the sun interacts with the house through the seasons. These observations will be used to plan the passive solar retrofit, not only the building design, but also the materials used. 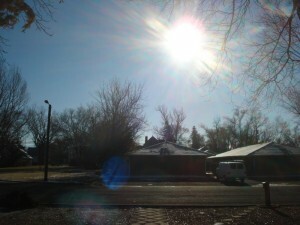 In the winter, the sun travels a short and low arc across the sky. Because of this, the winter sun can shine its solar heat energy deep into the house and be absorbed into the thermal mass to warm it. Click on a picture below to enter the gallery. Click on the right side of the picture to go to the next one, or the left side of the picture to see the previous one. Click anywhere outside of the picture to exit the slideshow. The summer sun travels a wider and higher arc across the sky. If a house is constructed with some type of overhang that shields the windows and keeps the sun’s heat energy from entering the house and from being absorbed into the thermal mass (and is insulated) the house will stay cool. These pictures are before the retrofit process begins. Ideally, the rock, or thermal mass, is located inside of the house. A large portion of the winter sun’s heat energy will strike the front of the house, while in the summer, the wider and higher arc traveled through the sky makes the hottest concentration of heat energy on the west side of the house. 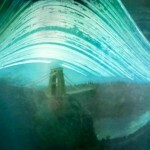 This is a related post about a pinhole photography artist that captured the sun’s movement from winter to summer solstice on a single sheet of paper. The sun’s summer and winter arc strike a nice comparison. See a related page that show a diagram of the sun’s movement through the year. Cool Keya. A nice explanation and demonstration. “while in the summer, the wider and higher arc traveled through the sky makes the hottest concentration of heat energy on the west side of the house.” Where then would the hottest concentration of heat energy be in the winter? I am trying to determine whether there is an advantage, for winter heating, to angling the solar glazing of the house southwest so as to maximize the solar gain. If you are in the northern hemisphere, it would be best to angle the house toward the south, since the sun rotates (travels) a low arc across the sky. Here’s a picture of the sun’s path throughout the year. http://greenpassivesolar.com/2010/05/movement-of-sun/. You’ll see that the smallest or shallowest arc is the sun on the winter solstice. It would not really make sense to angle the house to the southwest to capture the winter sun since it travels a shallow path, and in order to capture the winter sun, a passive solar home should be angled to the south. Best of luck and let me know if that answers your question. It depends on where you’re located in the world.